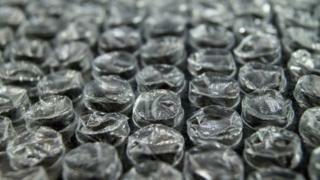 The University of Leicester students' union is planning "bubble wrap stations" where students can relax by popping the packaging material. Michael Rubin, president elect of the students' union, said "mental well-being is a top priority" during exams. "We know how stressful exams can be," says Mr Rubin. Nia Phillips, a media and sociology student, says many students "may feel too ashamed to speak out about exam stress". And she says that public events aimed at reducing stress can help students "without having to announce to anyone how they're feeling". Last week, at Bath Spa University, a petting zoo was set up outside the university library, offering such diversions as stroking goats and feeding ducks. Earlier in the year, Leicester had tested its own animal relaxation, with a cow, goat, geese, chickens and a Shetland pony. This has become an international phenomenon. Last week, the University of Canberra ran a stress-busting week, offering a petting zoo, with piglets and lambs, and a pop-up pub. However there have been animal rights' challenges to the concept of a petting zoo. Stirling University decided against a petting zoo after being contacted with concerns about the welfare of animals. Animal rights' campaigners, Peta, welcomed the decision by Stirling students, saying it would spare animals the "stress of travel, confinement and handling". They recommended bouncy castles or back massages as alternative options. Such experiments can be problematic in other ways. Earlier this month, at a university in Missouri in the United States, a bear cub in a petting zoo bit one of the students. The university then had to put out a statement to say that the bear did not have rabies. Appropriately for the exam season, the university said: "The bear cub does not have to go through any additional testing and will be spared."